Ouseburn is one of my favourite areas of Newcastle; a little valley just a short distance from the city centre full of interesting, arty venues. Well, it’s now been made even better since it’s resident watering hole, The Ship, has adopted a completely vegan food menu, complete with a Sunday roast! Hallelujah. On a summery day off work, me & Michael cycled into town to do some shopping and having heard whispers of the pub’s vegan menu, decided to stop by for dinner on our way home and see what it was like. The refurbished kitchen has been fitted with entirely new equipment, meaning that those work surfaces have never even seen an animal product! The menu (which has now been expanded!) offered plenty of choice, with everything reasonably priced. The chips which came with the burger, were DELICIOUS, pub chips can invariably be the bog standard frozen kind; these were so far from that – perfectly crisp and crunchy on the outside and fluffy on the inside (I think I’m in love). And when Michael asked for sauce to accompany the meal, he wasn’t given any old ketchup, but a sweet and flavourful homemade ketchup. I opted for the curry, which was rich and tomatoey, packed with chickpeas & potatoes and served with fragrant rice and naan bread – carby heaven. We left already making plans to come back. One delightful Sunday, I was greeted from work with a bunch of sunflowers and taken back to the Ship for a roast dinner (best day ever?!) and it was amazing. Homemade aubergine nut roast served with mash, roasties, greens, carrots and gravy, all washed down with a cold glass of Blue Moon in the glorious sunshine. Possibly one of the tastiest nut roasts I’ve tried, it was clearly fresh and just packed with flavour. The only thing missing was a vegan yorkshire pud or two! 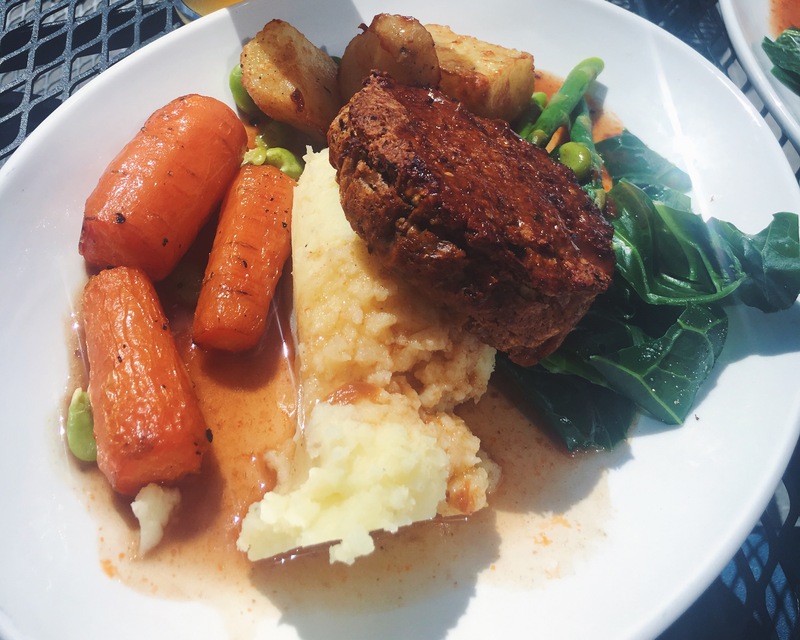 Serving up such top quality vegan food whilst maintaining it’s classic pub look & feel, Ship Ouseburn is certainly a unique find. The only thing you need to be wary of is the drinks – as a pub, they obviously have a huge selection of alcohol, not all of which is vegan (but a quick browse on Barnivore will set you right in minutes). With new additions to the menu such as buffalo cauliflower, thai green curry & sweet onion wellington (!!!) and some sublime looking desserts, I think this might just become my regular. My goodness, cearly Reading was not the place to be yesterday. I had to make do with the bare minimum. I’ll have to try The Ship! RECIPE | SUPER EASY CRÊPES FOR PANCAKE DAY!